Flat feet or pronation in the feet can cause pain and other foot problems. Children are born with flat feet initially and arches form over time. By the time a child is between 4-8 year old, they should be forming arches. 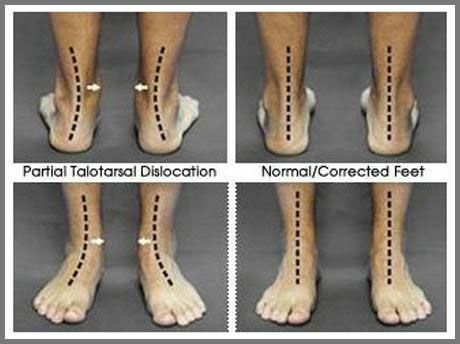 However, genetics and other conditions can cause a person to have flat feet that do not correct themselves. What Do The Arches in Your Feet Do? Your arches are responsible to stabilize the feet and distributing weight and the shock of touching the ground. Flat feet can cause a slew of foot problems including chronic ankle sprains, bunions, hammertoes and much more. In addition, flat feet can cause problems for your whole body. Your knees and back can experience pain and problems due to the way your feet touch the ground and the lack of arches. Flat feet can have an impact on your life or the life of your child. Many parents may not even notice their child's flat feet until they stop and look. However, your child may be trying to tell you they are experiencing pain. Often children will sit out of activities, want to be picked up or put in a stroller, or straight out complain about pain in their feet or ankles. Treatment for flat feet can include custom orthotics which can help force your foot into a position similar to that of a foot with an arch. In addition, certain stretches and exercises can help to relieve pain and stretch the tendons. Finally, cortisone injections and invasive surgery are more serious treatment options available. Hyprocure is a minimally invasive, quick and effective treatment option. With this treatment option, a titanium stint is placed into space in between the ankle and foot. Hyprocure painlessly realigns the position of the foot to act as though there is an arch in place. Hyprocure is an FDA approved treatment that can help to prevent some of the common foot problems caused by flat feet. Bunions, hammertoes, and chronic ankle sprains. This treatment option is quick and effective and a great option for children experiencing pain and injuries from their flat feet. If your child has flat feet and pain caused by their flat feet, call our office to schedule your appointment and discuss painless and effective treatment options.